A space to unwind, get creative, laugh until you cry and find that your new best friends are hair magicians, and your glass is always full! 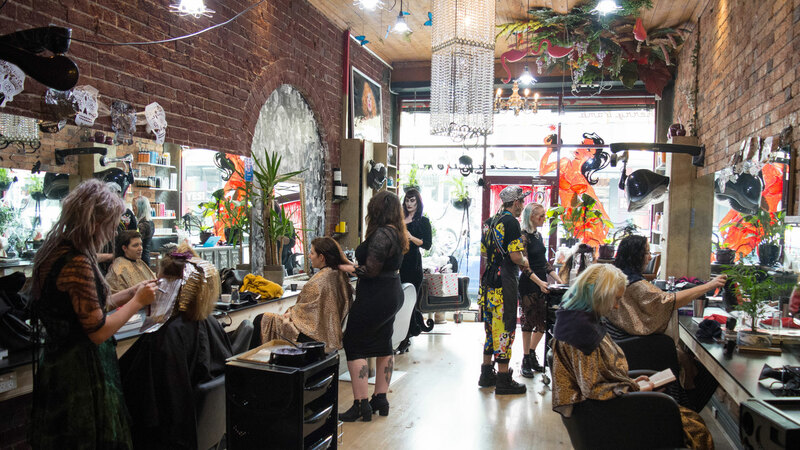 We are a freedom of expression, gender neutral salon catering to every walk of life! You will always be welcomed and feel comfortable to be yourself from the moment you walk in, to when you leave with amazing hair. We believe you should be listened to properly, your hair should be 100% YOU and the hair should speak for itself, with minimal effort from you at home. Head on over to our Instagram and get involved in our funky haus of hair, or come on in for a visit! Welcome to the Family, Bombshell! Whether you need creative colour, cutting, balayage, extensions, a crew cut, some curly hair magic, or anything in between, we do it all, and damn well! We love what we do and live to make your inner rockstar shine! Our top priority is always the health of your hair, hair in good condition will always be better than any colour. I had the greatest time yesterday with this sweetheart. She was so accommodating and made me feel super comfortable. Great chats and laughs had by all! The thing that I loved the most was, there was questions about how I do my hair, like for example - how i would brush my fringe, and in doing that, the cut was suited perfectly to me, even on my bad hair days!! She also explained everything! what products she was using and why, and telling me how my hair was going through each process! Angela's attention to detail is on point!Would recommend, for sure. Thanks again Angela! I absolutely loved this place. As a first time client, Imogene really took the time to listen to what I wanted, chat with me about my options, and answer all of my silly questions. She was super conscientious with my highlights and I'm so pleased with how they came out. Such a relaxed and pleasant ambiance as well, overall a fantastic place. Thanks again Imogene! Carmen is legit my new favourite person. Ever. I went into Cherry Bomb with a really clear idea of what I wanted.. We sat and had a really great, really thorough conversation and she brought my whole vision to life. I was a first-timer at Cherry Bomb.. I chose them because of their reputation for good bold colourists. Again.. did not disappoint. I am really fussy about what I want and I got it. Service from my first phone call (They called me back same day) to impromptu photo shoot at the end was warm, welcoming and lovely.